On previous trips to Paris, I’ve enjoyed great stays at a couple of Starwood properties — the Luxury Collection’s Prince de Galles and the W – Paris Opéra. On my most recent trip to the City of Light, I decided to give SPG’s The Westin Paris – Vendôme a first-time whirl, and what I found there was definitely not what I expected. The stately facade of the Westin Paris – Vendôme. When in Paris, I love staying in fancy hotels that still allow me to experience a slice of local life; check out my recent review of the Park Hyatt Paris – Vendôme and you’ll see what I mean. On this latest trip, though, a friend of mine pushed me to stay at the Westin Paris – Vendôme, part of a brand I associate with conferences rather than luxury. Despite my misgivings, though, my friend absolutely insisted on this property, so I half-heartedly gave in — and was pleasantly surprised. The Westin Paris – Vendôme is in the first arrondissement, smack in the middle of Paris. You can walk to the Louvre and the Place Vendôme, and it’s even closer to the hip Marais district than the Prince de Galles hotel. It’s set right across the street from the Tuileries, which is a breath of fresh air in the city; many of the Westin’s rooms and suites offer views of this absolutely beautiful park. I loved strolling through the marble-paved lobby of the Westin Paris – Vendôme. The average pre-paid room rate is €871 ($952), but note that they’re currently running a “Suite Dreams” special, which for €911 ($996) is 10% off the regular rate, plus you receive breakfast, high-speed internet, a small box of essential oils, VIP amenities and 3,000 SPG bonus Starpoints per stay. At this Category 6 property, the usual redemption rate for a Standard room is between 20,000 and 25,000 Starpoints. When I booked there were no Standard rooms at 20,000 points, though, so I asked for and was given a Deluxe room at 22,500 points. Be aware that you’ll have to call ahead in order to try for these Deluxe rooms, but please don’t be crestfallen if there isn’t any availability; when it comes to upgrades, though it never hurts to call, you should always be prepared for disappointment. In a sign that my SPG Ambassador status is sometimes worthwhile, I was upgraded upon check-in to a gorgeous Junior Suite on the fifth floor, with direct views of the Eiffel Tower. 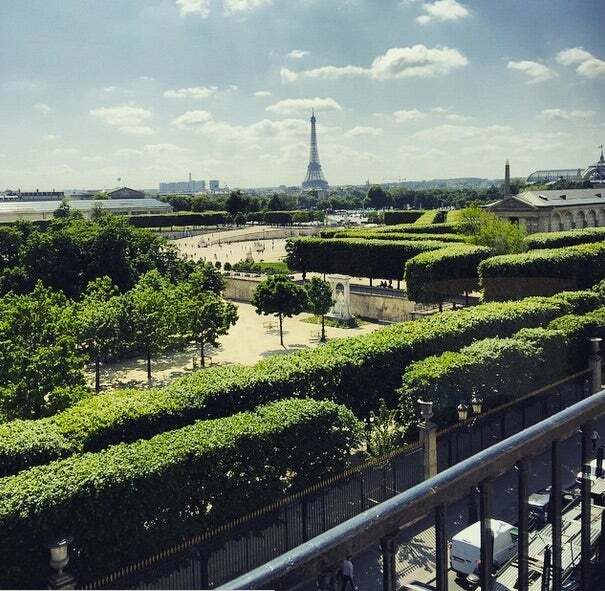 The priceless view from my Junior Suite at the Westin Paris – Vendôme. The Guest Services manager escorted me to my room and was happy to show me all of its features; I’d heard they were really good with Platinum members, and the rumors are true. And my Ambassador did a great job, too; there was a bottle of Laurent-Perrier Champagne, Ladurée macarons and some sparkling water waiting for me in the suite. My Junior Suite at the Westin was anything but junior. I absolutely loved this suite. Instead of a regular room with a little extra space, it was a gigantic, square room with a very comfortable sitting area. Judging from the light-filled room, tall ceilings and sense of space, this Westin is far brighter and airer than I would have imagined. At this property, the Westin Heavenly Bed is aptly named. The Westin Heavenly Bed is aptly named, too — I had some really great nights of sleep in mine. It’s safe to say that I can get behind Westin’s version of luxury. Due to a glitchy knob, the shower can get scalding hot — proceed with caution. The one drawback was the glitchy shower temperature control, the kind that requires you to guestimate that fine line between simply getting clean and scalding yourself. Proceed with caution. My friend Bruce had the Platinum breakfast — served at the hotel’s restaurant, le First — which is supposed to be only continental, but they actually let you choose pretty much everything from the whole buffet. I enjoyed lunch at le First in the lovely inner courtyard of the Westin Paris – Vendôme. I had lunch at le First as well, in the outdoor courtyard, but the food was nothing to write home about. I also had room service, and none of it was great. Luckily, though, I was in the gastronomic paradise of Paris — so I didn’t exactly starve. The Six Senses Spa has a ton of facial and massage treatments on the menu, as well as “Spa Journeys” that combine treatments. The WestinWORKOUT Gym is a bit cramped and located in the basement, but on the plus side there’s a space for stretching, yoga or anything else for which you need a bit of room. And the gym provides towels and bottled water, which, although the norm, is still appreciated. I’d recommend the Westin Paris – Vendôme to anyone, especially first-time visitors to the city, for its comfort and location. This isn’t your typical Westin — the hotel is truly awesome. The only downside is that it’s in a massive building; from the elevators it was a solid six-minute walk to my room. That said, I’d happily hoof it a mile to get to a such a gorgeous suite. On points, the Westin Paris – Vendôme costs less than the Prince de Galles (even though the latter property is certainly more chic), but it still represents a good SPG redemption. While I’ll probably go back to one of my favorites on my next visit, this is a solid property that I wouldn’t hesitate to recommend to anyone, especially first-time visitors to Paris. They take good care of you here, and it’s in a prime location; you can walk to most of the major sites on your itinerary, as well as the Métro. Don’t let the Westin name fool you — this property is truly five-star!